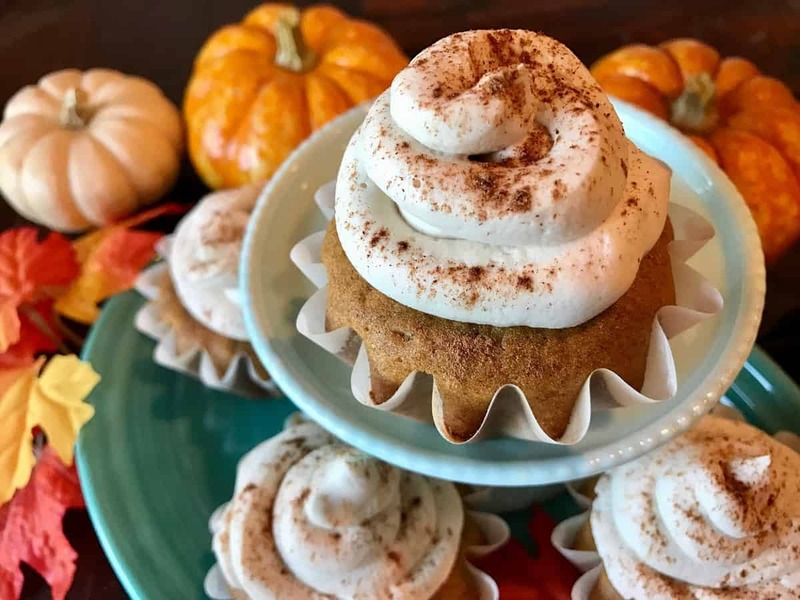 Fellow dessert lovers, pumpkin spice lovers, and/or cupcake lovers: OH. MAN. Have I got a recipe for you! This is serious…. and I mean REALLY serious. 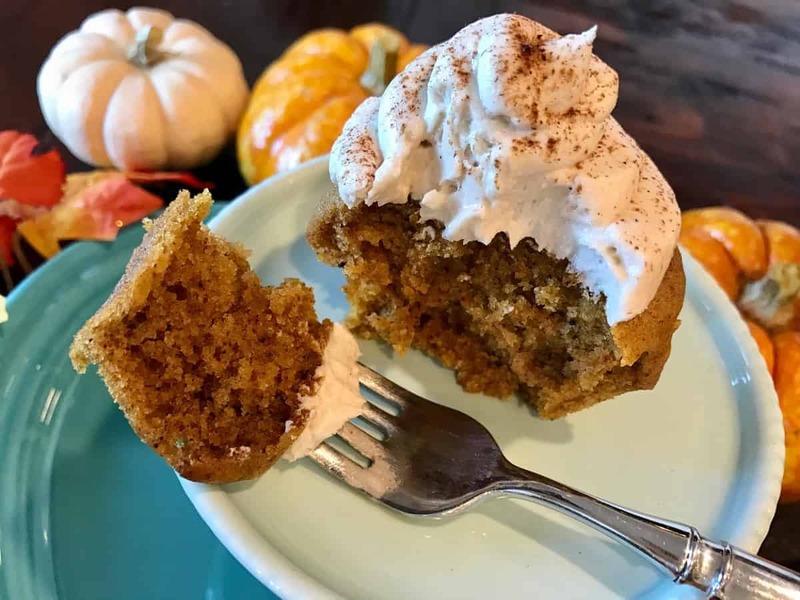 Soft, moist pumpkin spiced cake topped with super creamy, sweet and slightly salty frosting. Jeff and I both agree; this is one of the best recipes ever created in this kitchen! Me – YES to the first question and actually NO to the second one. Here’s why: I am a strong believer in the true sense of balance when it comes to food: Eat mostly “whole, unprocessed, from the ground foods” throughout each day, but then have a small treat once a day, and a big treat about once a week or on special occasions. (I talk more about this in my post, Let’s Love Dessert Again) Treats for me are desserts, but for others may be salty sensations like chips, pizza or french fries. I love those foods, too, but desserts definitely take the cake, so to speak! But I promise you this: when I post a dessert recipe, each one will be made with the highest quality and most nutrient dense ingredients possible without sacrificing flavor, and, the desserts will almost always be perfectly portioned. 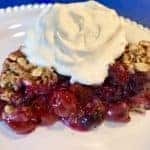 Hence some of my other dessert recipes: Single Serving Apple Crisp, Sweet Strawberry Shortcake with Lemon Whipped Cream, 3-Minute Chocolatey Mousse, and Cinnamon Cookie Cashew Ice Cream. 1. First, some minor prep work: pre-heat your oven to 350 degrees, and then, line your cupcake tin with cupcake liners. 2. Next, in a small mixing bowl, combine the “dry” ingredients: Flour, baking soda, salt, pumpkin pie spice, ground cinnamon and ground cloves. Set this aside. 3. 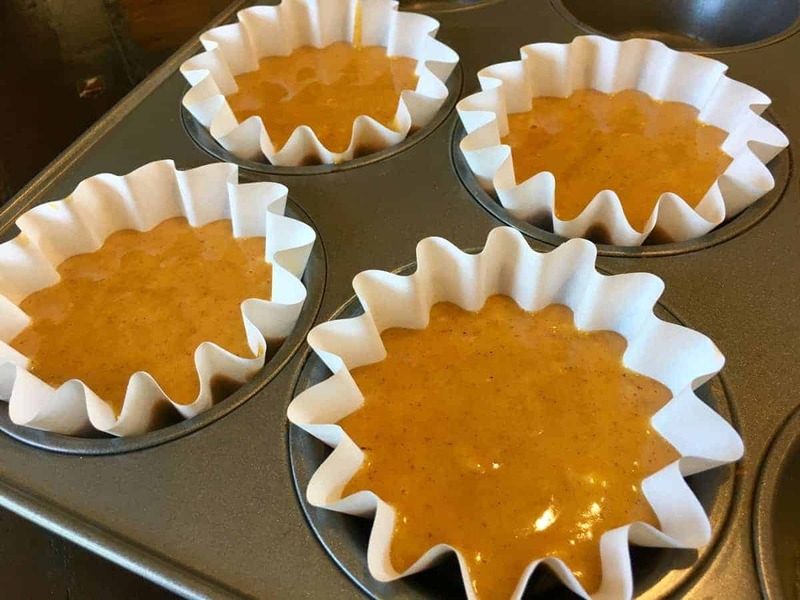 In a medium sized mixing bowl, stir together your remaining “wet” ingredients: Canned pumpkin, vanilla extract, oil, sugar, maple syrup, vinegar, and milk. 4 Now, carefully add your flour mixture to the bowl with the wet ingredients and stir until smooth and all flour is incorporated. 5. 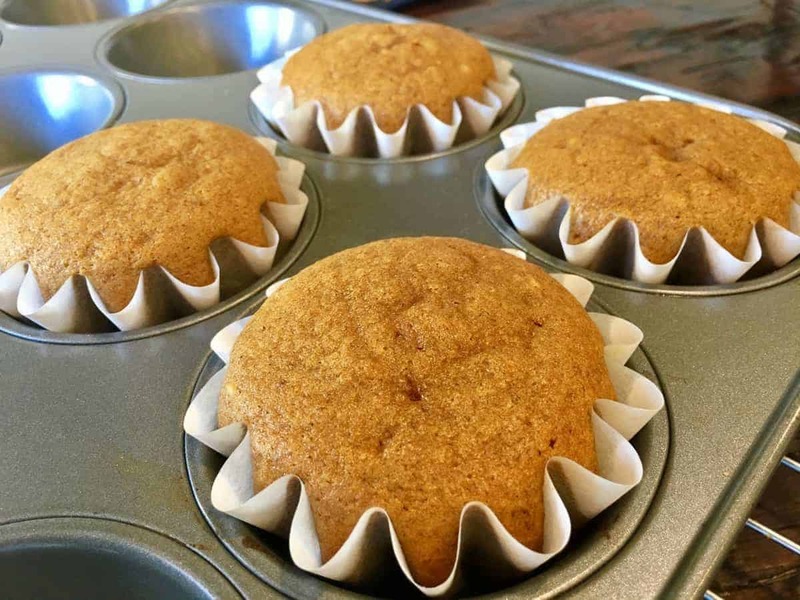 Divide this batter evenly amongst the cupcake liners…..
And bake them in your pre-heated oven for 20 – 24 minutes. 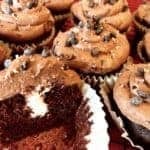 Once you remove them from the oven, poke one or two of the cupcakes with a toothpick right down the center – if it comes out clean and free of cake batter, the cupcakes are done! 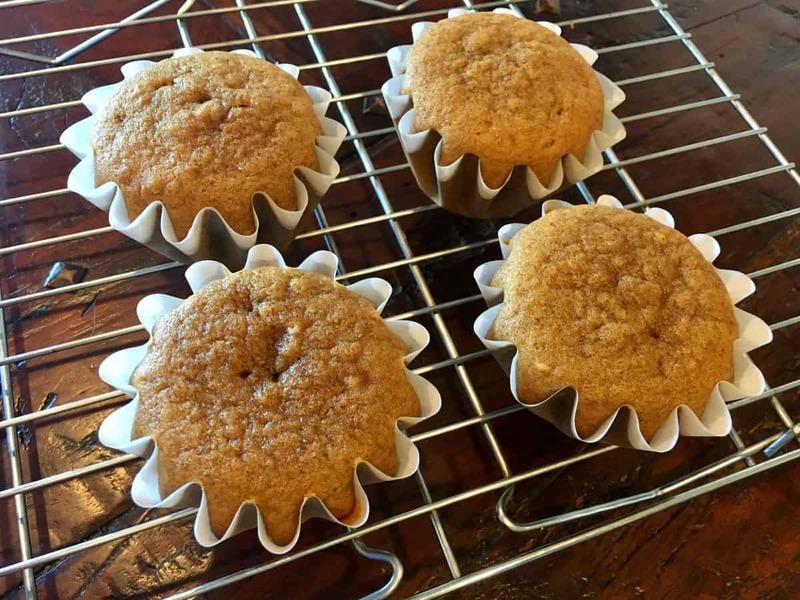 Once cool enough to handle, place cupcakes on a cooling rack. 1. 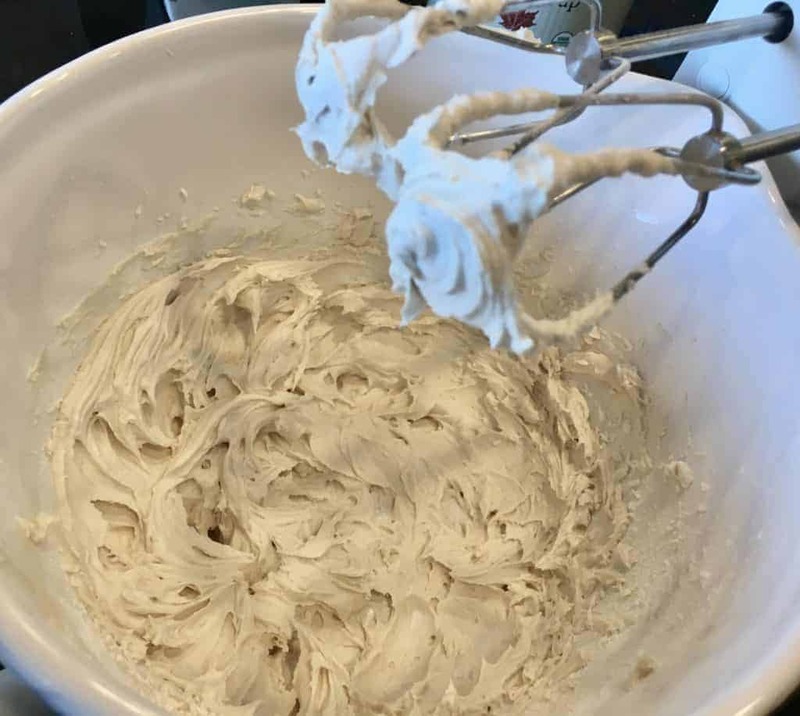 Using a high speed hand or stand mixer, whip just the shortening on high speed for 30 seconds. 2. Next, add the maple syrup, maple extract, vanilla extract, approx. half the powdered sugar, and salt. Mix on high for another 30 seconds. 3. Lastly, add the second half of the powdered sugar and then mix on high again for about 1 – 2 minutes or until the frosting is light and fluffy. 4. Once your cupcakes are completely cooled, it’s time to frost! 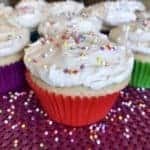 Go the old school route and frost your cupcakes with a butter knife, or, get fancy and place the frosting in a gallon sized plastic bag or a pastry bag, snip off the corner or tip and pipe the frosting on your cupcakes that way (with or without a piping tip!) Both will get the job done. 5. Lastly, carefully dust each cupcake with ground cinnamon. 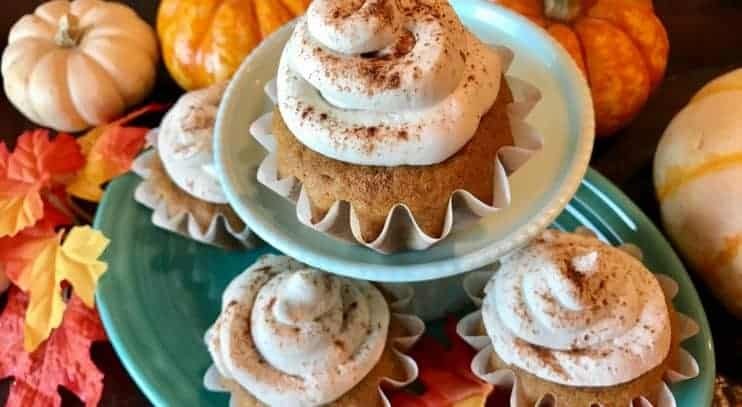 This is optional, of course, but I like doing this because it looks pretty, and because it let’s your family and friends know that they have a cinnamon-y delight headed straight for their tastebuds. 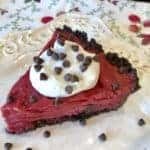 I hope you love, love, love this recipe as much as we do!! 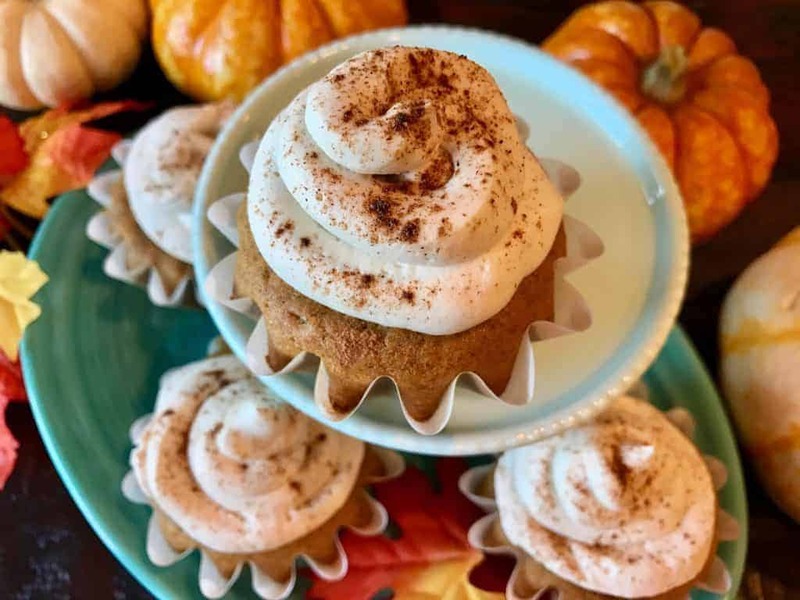 Vegan Pumpkin Spiced Cupcakes with Salted Maple Frosting – for 4! Watch this video to see how I make these cupcakes! When are you coming out with a cookbook? I just made the pumpkin cupcakes DELISH!! I ate one without frosting and was blown away. . I have made the Peanuts chocolate chunk cookies, again, DELISH!! My only frustration is trying to find a recipe analyzer that calculates the nutritional value. My husband is closely watching his carbs and calories for diabetic reasons. He is a big fan of the cookies and I am pretty sure they have beat the Nestles Toll House which were his favorites. 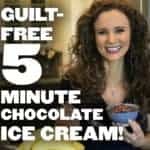 I am now a believer that gluten free and vegan can be tasty and satisfy that sweet tooth. Tomorrow morning I will be making your pumpkin pancakes, I am not leary about this at all. 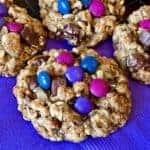 I would love to see you do a cookbook with nutritional values for the recipes. Thank you again for making me a believer and making baking fun again. Thank you for these kind words, Lynda!! I’m so happy you enjoyed the cupcakes and Peanut’s Bake Shop Cookies! I hope you loved the pancakes, too. As for nutrition facts for the cookies, the carbs and calories are stated on the back of the package. The only thing you need to add in are the numbers for the oil that you add. If you should decide to try them oil-free, you can! Simply use 1/4 cup apple sauce instead of 1/3 cup of oil and stir well. As for the cookbook, it is definitely on my list! 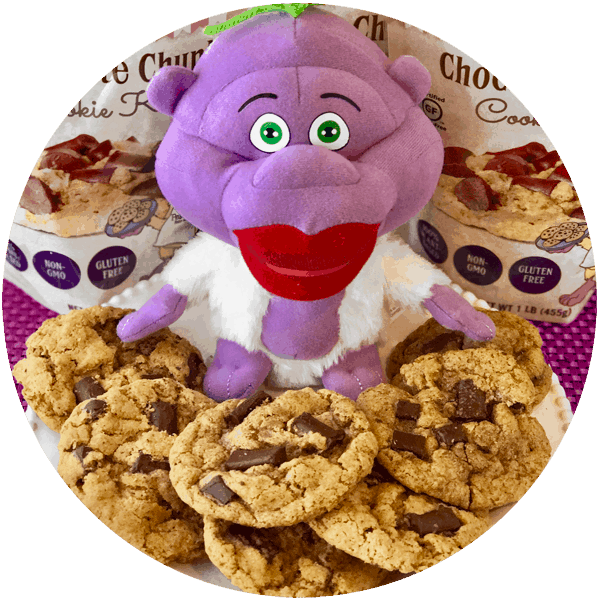 I’m working hard on getting a couple more Peanut’s Bake Shop cookie products into production first. Thank you, again, for the amazingly flattering comment! All the best to you and your husband!